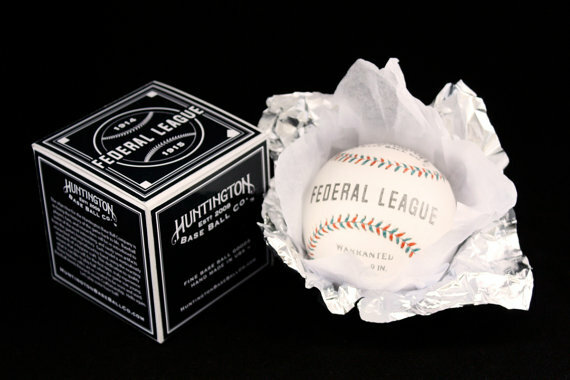 This morning I came across this – a nice looking old Federal League ball. Well, no. Not old. Brand new, and made-to-order by the fine folks at the Huntington Base Ball Company, purveyors of hand-crafted base ball equipment since 2009. I came across them on their Etsy site, but they have their own online store as well. From day one, my goal for the Huntington Base Ball Company has been to bring the history of the game back to life through beautifully crafted and game-ready equipment. Each model is meticulously researched and re-created by hand, using the exacting standards of a bygone craft. This dedication to quality ensures that you will, for the first time, truly experience what it was like to play ball when the game was young. Though beautiful on display, these historic relics are re-created to be worn and used. Huntington makes a variety of bats, balls, and gloves, and they are beautiful.